Bristol Beaufighter is a World War II airplane wreck dive in Malta. Beaufighter was built by Bristol Aeroplane Company and it served in Royal Air Force. The plane was a twin-engine two-seat heavy fighter, about 12.6 m in length with 17.6 m wingspan. On 17th March 1943 soon after takeoff, this Beaufighter experienced mechanical problems, and the crew had to ditch the plane in the sea. Both the pilot and the observer survived. 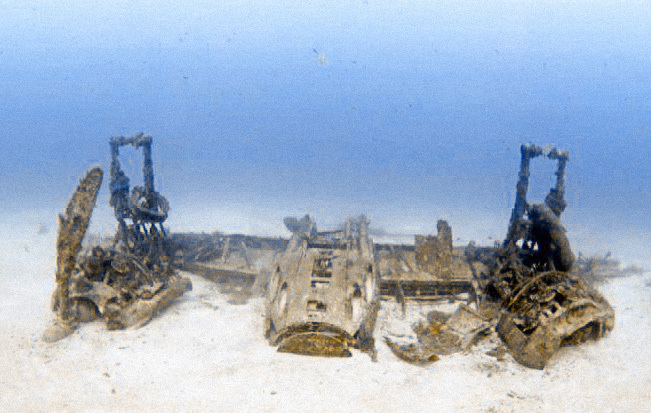 Bristol Beaufighter wreck is located about 900 m offshore St. Julian’s Point in Sliema. This is a boat dive for experienced divers. The airplane wreck lies upside down at a depth of 38 m on sandy seabed. Most of the plane is buried in the sand, the wings and the main fuselage are quite intact, both undercarriage frames with shredded tyres stick out behind the radial engines, and port side propeller still attached to the engine. Other airplane wreck dives in Malta are Bristol Blenheim Bomber, Mosquito Fighter Bomber and Lockheed P2V Neptune. These plane wrecks are between 32 and 42 m deep. Furthermore, for technical divers there are the airplane wrecks of Fairey Swordfish at 55 m, Junkers Ju 88 at 57 m, and Liberator Bomber B24 at 90 m depth. Please Log in or register to rate. ★★☆☆☆ There is not that much to see anymore. Just underside of a wing and couple of engines.